There is no half way to describe formidable events like these, in which all you can taste is the delicacy of raw, wild, honest talent and passion. 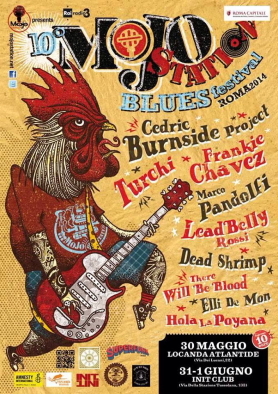 The Mojo Station Festival is an idea of Gianluca Diana and Pietropaolo Moroncelli, who know each other since 30-odd years and love the blues straight to the bone to the point of self-finance the whole event just for the love of music and blues in particular. A story made of endless visits to Mississippi and New Orleans, purely to connect their blues DNA stronger and stronger with this part of the United States through living and breathing the sounds and the soul of the roots and bonding great relationship with musicians belonging to this well-aged but formidable genre. A project created and supported by the immense work done by Pietropaolo and Gianluca, (the latter living literally his life for the blues through writing for an Italian National Newspaper, DJing for the Italian National Radio and hosting shows in Local Radio, always in the name and love for the genre) and without whom, would have no reasons to exist. Pass by this sweet and unassuming female on the street, you might think she's just an ordinary young lady. See her on stage with two 12-string guitars, one microphone, harmonica, tambourine wrapped around the left ankle, and stomp box under the right foot, you'd swear she is someone else altogether! "I have always been blessed with knowing who and what I wanted to be from an early age. The day I sat down at the piano and played my first note was the day I decided my purpose in life was to make music for people," Thom writes within the liner notes of Flesh and Blood (2012), her fourth solo album. And such, the 200 seat intimate atmosphere at One Longfellow Square is the optimum setting for the artist to fully connect with new and old fans who are sitting a stones throw away. In no time, Thom sets the tempo for the 100 minute set, launching into an unrestrained, roadhouse blues, harmonica solo. The crowd 'hoots' and 'whistles', recognizing the intro to "Help Me", the Sonny Boy Williamson blues number she covered on Flesh and Blood. Add tambourine, then guitar, to the melody, and a palpable energy mounts. Soon the wooden floor beneath our feet vibrates as a rhythmic thumping from the stomp box under her foot radiates outward. "Won't you help me baby...Won't you help me darling," Thom sings out, in her signature vocal style: part gritty-growl, part angelic-lullaby. The shows off to a great start. As I watch this one-woman band, I can't help but marvel at her elegance, her graceful composure. She's in full control of her surroundings: melody, lyrics, instrumentation, and audience. 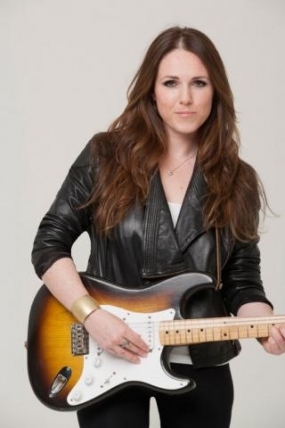 She looks everyone in the eye and lets loose on the sultry, up tempo, R&B number, "Stormy Weather". She discovered she "could have a voice, say something important," as a result of listening to Canadian-American folk singer, Buffy Sainte-Marie, on the car radio. She was six years old. At 14, Thom savored her first taste of professional life when joining a local pub, cover band. "Great fun! An absolute blast! (They were) "... kind of like fathers," says Thom, referring to band mates thirty years her senior. "The benefit: they introduced me to their music. Fleetwood Mac. The Eagles ...We would play this song ... Landslide." The version is impeccable, as if she'd wrote it herself. "Took a lot of solace in alcohol—in a pub—where many of the worlds problems are solved," she remarks, tuning the 12-string Taylor in her arms. "Asked, 'Who are your greatest influences?' Stevie Nicks. Buffy Sainte-Marie ... and one karaoke drunk who sung like an angel," Thom says of the inspiration behind "Human Jukebox", from Merchant and Thieves (2010). Here, Thom's softer tones drive home the meaning behind the lyrics. "He's healing hearts with this song ... He's a human jukebox." The attentive crowd absorbs all the soul Thom can pour out in one evening, as she continues to alternate between sentimental ballads, pop hits, and driving, blues-rock numbers from her five albums. It's the perfect blend of emotion, instrumentation and vocal prowess. Thom's lyrical honesty and one-on-one approach is purposeful and heartwarming. She makes an indelible impact on the listening audience, drawing them into her "personal" space - forever. I encourage you to read an interview with The Daily Beast, where Thom openly dishes on the ups/downs of the business. It is truly an enlightening story. Be sure to check out Thom's Youtube channel and follow her on Facebook. For all things "Sandi," including news on her upcoming sixth solo album, fall tour and more, visit www.sandithom.com. Photo (top left) courtesy of Sandi Thom, Guardian Angel Records. Photo (bottom right) courtesy of A. J. St. Pierre. 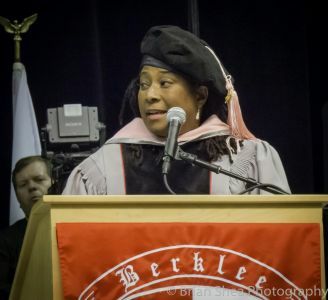 Editor's Note: Congratulations to Valerie Simpson for her Honorary Doctorate in Music bestowed by the Berklee College of Music! Valerie performed in the Berklee Pre-Commencement show that was held by students and faculty to interpret the songs of the honorees and elite guests. It was a privilege for BBR to provide footage for the 2014 Berklee College of Music Commencement Ceremony the next day. All events were closed to the public. Jimmy Page called Valerie Simpson's performance, "Superb." When we heard of this fabulous event, we asked Motown drummer, producer, writer, Drew Schultz, to take some time from his busy performance schedule, and post an in depth article on Valerie - now known as Dr. Simpson. ~ Berklee Student Speaker, Drew Krasner, quoting Howard Thurman on Commencement Day, 2014. May 10, 2014 was a Celebration Day for the Berklee College of Music in Boston. Jimmy Page, Geri Allen, Valerie Simpson, and Thara Memory received Honorary Doctor of Music degrees as presented by Roger H. Brown, Berklee President. 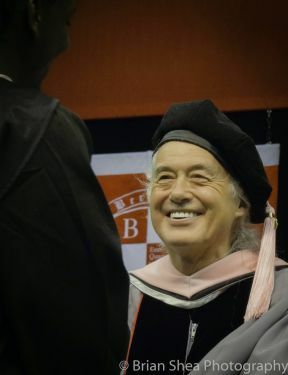 Led Zeppelin's Jimmy Page, now Dr.James Patrick Page, was the key note speaker to graduates at the Agganis Arena. The private Baccalaureate ceremony, open to only graduates and their families. was held to bestow degrees such as professional music, music business management and performance. Experience Langhorne Slim as you've never seen or heard him. 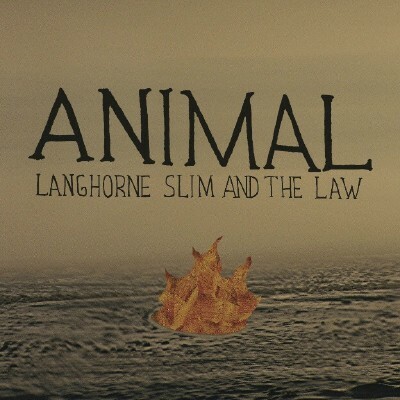 Langhorne Slim and The Law hit you with the raw sounds and literally sharp edges of unconscious symbols, direct lyrics of strength and exploration, as they make you face yourself. Out of touch with reality is never the case. Crazy in a good way is the vibe here. Get ready for the screams. Langhorne's music is always evolving, pushing ideas into the exosphere, making it easier for the rest of us to find our ways home again. Are you a long time Langhorne fan? Listen for the references to his back to the wild themed lyrics. He also seems to be digging deep into earlier inspirations of experimentalism. Warning: expect to be exhausted after viewing this video. The World Celebrates 50 Years of The BEATLES!